"How to backup virtual machines running under VMWare type 1 hypervisor (ESX, ESXi free or vSphere)"
The article describes methods of creating backups of virtual machines running under VMWare type 1 hypervisor (ESX, ESXi, vSphere). The solution discussed in this article allows for easy backups of virtual machines from VMWare hypervisor without the need to install a client inside virtual machines. Such backups mean it is possible to restore the virtual machine on the same or different host in a fast and easy manner. Please note: understanding the following description requires knowledge of physical machine backups. The main characteristics of file backups in Ferro Backup System can be found in the user manual. The standard installation package of Ferro Backup System includes two applications: FBS Server (the server) which needs to be installed on one of the machines in the network (physical or virtual) and FBS Worker (the client), which needs to be installed on all machines to be backed up (physical and virtual). To backup a type 1 hypervisor one more application is needed - Backup Connector for VMWare. That application needs to be installed on one of the machines on which FBSWorker (the client) had previously been installed. In a test environment all three applications can be installed on the same machine but in production environments FBS Server is usually installed on a different machine - a so-called backup server. Backup Connector for VMWare connects to the selected host and share data stores with the client, which in turn submits that information to the backup server. The backup server console operator will see all files of virtual machines located in the host's data stores. For optimum performance the backup should be created on a workstation with a very robust connection to the host, sufficient CPU performance and installed .NET environment 4.5 or newer. It can be either a physical machine or a virtual one (on the same host or another). If the backup window is short and there are many virtual machines, distributed backup is an option. 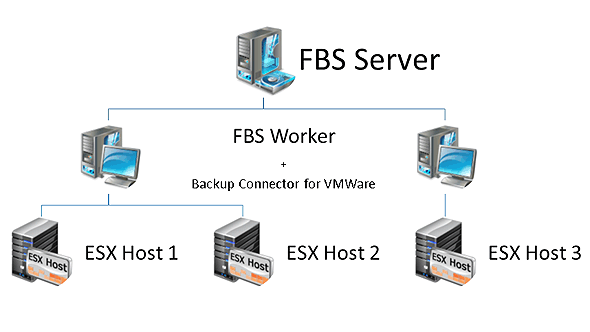 In that case FBS Worker and Backup Connector for VMWare need to be installed on two or more workstations to distribute backups so that each workstation handles part of the virtual machines of the host in question. Please note: no additional software needs to be installed to back up virtual machines - neither on the host, nor on the virtual machines. Please note: changes will be applied after the FBS Worker service has been relaunched. To apply changes without restarting the service click on "Test". After accepting the changes a new backup task needs to be created. In the backup range selection window the disk letter that was specified in the map command will be displayed. Ferro Backup System supports backups of both stopped and running virtual machines. To enable backups of running virtual machines check "Backup of locked and open files" in the workstation settings. If that option is checked prior to the backup of a running virtual machine the application will automatically create a snapshot of the virtual machine, create the backup copy and then remove the snapshot. If that option is unchecked an error will be displayed in the case of running virtual machines. Because VMDK files are usually very large turn on delta mode in the backup task settings. Now the application will only back up those parts of VMDK files which had actually changed rather than entire files every time. This will greatly increase backup speed and reduce backup size. VMWare ESX does not perform snapshots of independent disks and Raw Device Mapping. If a virtual machine contains such devices backup will only be possible when the virtual machine is offline. Otherwise an error will be displayed and disks will not be included in the backup. At first glance backups of virtual machines may seem difficult but using Ferro Backup Systems they are as easy to perform as backups of files from a local disk. After mapping the hypervisor's data stores under a local disk letter just add virtual machine files to the backup range and specify where backups should be saved. The application will automatically handle snapshots of running virtual machines and differential backups on the file fragment level. You should see a file listing from the ESX host or an error message. esx GETF https://ESX_HOST_OR_IP/ password /USER:username "vm\ds\dir\filename.ext"
You should see a file content or an error message.